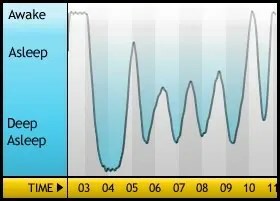 I bought Sleep Cycle for my iPod touch because it sounded right up my alley. It uses the accelerometer in i-devices to measure how much you move while asleep to track your sleep cycles. Then it wakes you up when you will be most alert. How cool is that? Well, it is pretty cool, but not because it tracks your sleep cycles, or because it wakes you up alert. 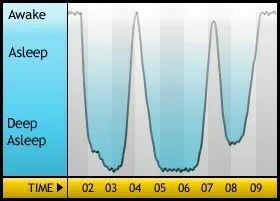 First of all, sleep cycles are defined by brainwave patterns, not by movement. 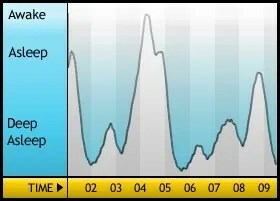 Perhaps it’s a decent analog–I’ve read that claim–but the charts that Sleep Cycle produces from my nights of sleep don’t look much like the examples of EEG readouts of sleepers. Where in this graph was I dreaming? It looks like I fell asleep and woke up pretty abruptly, and was awake for a short period just after 6 am, but that’s all I can tell. 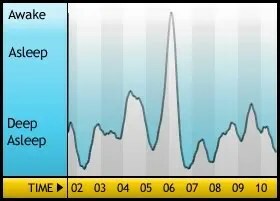 I can also say that the app does not always catch it when you wake up. I’ve gotten out of bed to pee and not made a spike out of the sleep zone. 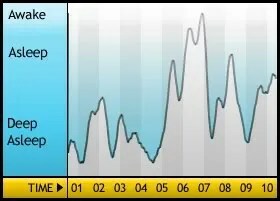 It is also not really useful for its primary purpose–to wake you up during the period that you will feel most rested. You set an alarm for the latest you want to wake up, and then a period of time during which it would be acceptable to wake up. 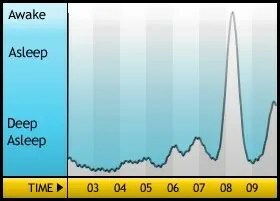 The alarm is supposed to go off at the point in that period when you are moving enough to indicate that you are in shallow sleep. Supposedly, if it waited longer and let you go back into deep sleep, you would wake up groggy because of it. 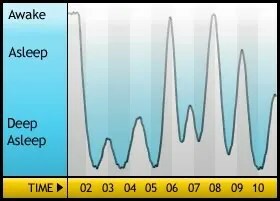 Still, Sleep Cycle is cool for a couple of reasons. First, It tracks how much time I give myself for sleeping. It starts counting when you set the alarm at night and stops when you wake up and keeps track. That’s how I know, for example, that I gave myself an average of 8 hours and 35 minutes to sleep in for the 155 nights before Reanna moved to Eugene. (It doesn’t work with two people in bed.) (And that included my last 125 days of grad school–not too bad!) That means I averaged fairly close to eight hours of sleep a night, with an estimated average sleep latency of 30 minutes. And that brings me to the coolest part. That looks like about an hour of insomnia. Don’t be fooled by the little initial drop–that was me lying very still, trying to sleep, before starting to toss and turn. This is really fun, but be aware that you can sink a lot of time into it. Here are a few randomy ngrams I made. Sorry, but you might have to zoom in to see the text. That’s control-plus for PCs and command-plus for Macs. It was a bit of a revelation when my physical therapist, Shannon, gave me my first set of personalized instructions on my posture. I am to roll my shoulders up and back, but not down! I said “You are the only person who has ever given me that instruction. Why shouldn’t I drop my shoulders down as far as they go?” She explained, using a skeleton hanging in her office, how, while that’s true for many people, they way my shoulder blades and spine where out of whack, and because of which muscles are too long and too short from misuse, I need to bring my shoulders up. And I need to bring my ears in line with my shoulder joints. And I can tell the proper tilt of my pelvis based on what gives me the most height. Try it–reach up and move your pelvis and see what position lets you reach the highest. That’s the position for you. After thinking about it, it seems obvious. Why would anyone think they could give me effective advice about my body without interacting with my body? I am 39, a couple of months from my 40th birthday. When do I hit middle age? Ah, that’s what I thought. I turn middle-aged at the end of this September. I first misread this one as “middle third,” somehow, which liked–very intuitive. For men in the US like myself, however, whose average lifespan is 75.6 years, it places middle age between 25 and 50 years old. That means I’ve been middle aged since 1996. And that Reanna, as a Canadian woman with an average lifespan of 82.9 years, has been middle-aged since six months after her 27th birthday. 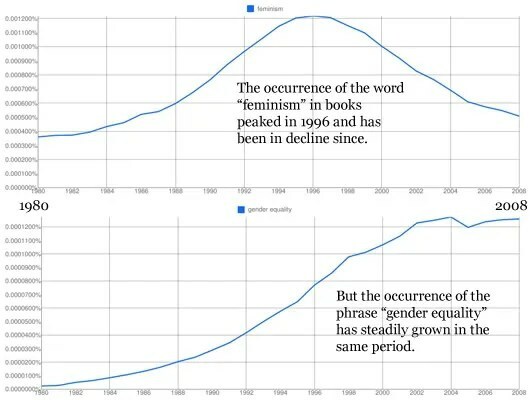 As my friend Julian pointed out, though, it actually says the third quarter: For men in the US from about 37.8 until about 57.7. It’s less intuitive for me, but lines up better with what people seem to mean by middle age. I am in a long, slow recovery from a sacroiliac joint sprain. I’ve just started being able to do more exercise than mild physiotherapy exercises, after almost nine months. I have to be careful, but I can do it. I am in the worst shape of my life, and generally I dislike it. The one nice thing, though, is how little I have to work to reach an aerobic heart rate. In my normal shape, for example, bicycling is not a good choice for an aerobic workout. I have to push uncomfortably hard just to get to my minimum, low-level aerobic heart rate. [Which is somewhere around 108 beats per minute–60% of an estimated maximum of 180, since I can’t yet push hard enough to discover what my actual max is.] Now I can hop on my bike and hit an aerobic zone within a minute of riding gently. Pretty nice!